Last week at SXSW, you may have spotted a glass box across from the Austin Convention Center and wondered what was going on inside. With an endless array of on-site activities including career coaching, video interviews, networking and power discussions, The Ipsos Girls' Lounge is all about stimulating conversation, confidence and collaboration. We gather at industry events around the world, because together, we can empower and inspire change. Inside the Lounge, Meredith Kopit Levien, EVP, Advertising, the New York Times, led a panel to discuss how women can be more visible in tech and raise money for their business ventures. When she asked how many women we knew trailblazing the tech landscape -- we quickly called out: Marissa, Sheryl, Megan. So few, that we referred to these women on a first-name basis. When 95 percent of all partners at VC firms in Silicon Valley are men, it's not surprising that Twitter, LinkedIn, Facebook and Snapchat were also founded by men. Which begs the question -- when raising capital is there something about women that makes us perform in a less entrepreneurial way? Some in the group were told they don't "peacock enough," or that, they give it away and need to own it. "But, keep in mind, if you don't have women in Silicon Valley, you're creating products for 50 percent of the population," she added. The VC world is changing, but at such a slow pace, because it takes a long time to build a track record and women are relatively new to the mix. Small groups tend to favor sameness over diversity. Women weren't part of the pattern. Today, women are starting small funds in the seed stage; they're opting in to run their own fund and investing in women. Once those women invest in more women you will see the seed change back into larger funds. If you compare the number of female investors in burgeoning markets like LA and Chicago to Silicon Valley-the stats are quite different. When Nisha Dua launched a fund to invest in women-led consumer tech start-ups, she was told by a fellow male VC that they simply wouldn't have much deal flow to share, "because there just weren't that many women start-up founders." Her response, "Actually, we can share deal flow, because we've seen 350 companies run by women in the eight months since we started. Women aren't necessarily getting to the male VCs." Today, she is a Principal at BBG Ventures, a New York-based seed stage venture capital fund which grew out of AOL's #BUILTBYGIRLS initiative. Kim Kelleher, Publisher of WIRED, who helped fundraise for two digital companies, CitySpree and Say Media (over $30 million dollars), said of the experience, "It was an adventure and it was hard, but I actually felt like there was a benefit to being the ONLY woman." Though, she shared a sobering stat -- women are raising only seven percent of the money for startups. As for my own story, I am the pioneer of online research; a mother (of three), a wife, a sister, a daughter and a girlfriend... and no one believed that I could do it all. I was the first female CEO in the top 25 research companies. When I sold my company, I worked with all VC guys. They ran a company built with numbers; I ran a company built with passion. They rewrote my pitch deck, because I was told, "This is how you do it." I flipped through it and did not recognize my company. I asked, "Where is my story and the people that brought my company to life?" My company was portrayed as vanilla, one-dimensional and flat. It looked like every other research company. So I added pictures, sound and color -- I brought the wow back and we closed the deal. Men and women: We're all important and difference brings tension to the table and tension brings success. I once said to a CEO, "If you want all of the same, then why do you have so many employees? Get rid of them, you're wasting money!" It's our responsibility to educate and lead the next generation, to sponsor and mentor the younger women we work with everyday. "But, how do you change the conversation for young women? How do you put tech next to Beyonce and the Kardashians? How do you bring all those conversations together and teach them to fundraise?" asked Nisha. In search for the answer, Nisha led the re-launch of millennial entertainment site Cambio as a site "for girls, built by girls" -- literally - in partnership with Girls Who Code. While girls are admiring the celebrity and jet-setting lifestyles of Beyonce and Kim Kardashian, we should be quick to point out they are also extremely savvy businesswomen. Beyonce hasn't slowed since she was a teen, amassing $115 million in 2014 alone; smartly releasing her entire fifth album, Beyoncé, all at once and exclusively on iTunes, with zero publicity. It was one of the most downloaded albums of 2014. The Kim Kardashian: Hollywood App has over 28 million downloads and 11 billion minutes of play since it launched last summer. It was also on track to take in over $200 million. If we tie culture to tech, we'll help bridge that gap. It's cognitive bias that stops people from educating girls. Nothing intrinsic is holding us back. It's cultural. There's still this glass ceiling to be shattered. But by and large, the world is moving forward. More women are getting advanced degrees. And more girls flock to Malala's strength, not her victimhood. It's about confidence and personal strategy. We are seeing young women and girls who have played sports throughout school coming into the startup and venture capital space who are ready to take on challenges with a newly honed entrepreneurial focus and a different point of view. I've always said that a caregiver is the best CEO. A caregiver is a nurturer, collaborator and team builder. We need to bring more caregivers to the table as they have the traits to help companies perform better. Madeleine Albright famously said, "There is a special place in hell reserved for women who don't help other women." 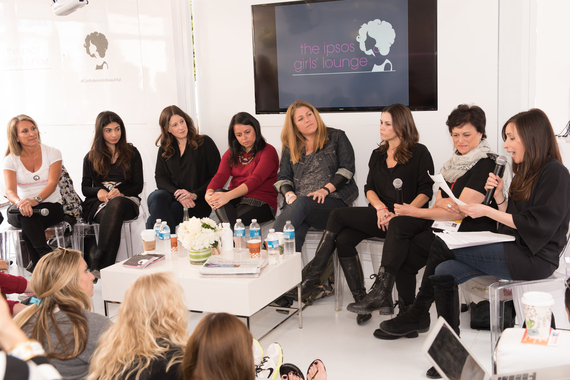 In The Ipsos Girls' Lounge we say, "There's a special place in heaven for women who help other women."